We find ourselves in possession of a brand new Mac mini with promise of "2x faster everything" and the new Thunderbolt I/O. Naturally, we had to take a look inside, just like we did with the new MacBook Air earlier today. 해당 분해도는 수리 안내서가 아닙니다. Mac mini Mid 2011 수리는 저희 서비스 설명서를 사용하십시오. Apple removed the optical drive from this mini, but would characteristically love to sell you one for an additional $79. Model Number A1347... This feels a little bit like déjà vu. After a few finger pushups and a firm twist, we get our first glimpse of the innards. The first thing out the hole? The fan. No surprises here. The new mini has the same fan as the old mini, and even the older mini. Sticking with the brushless, high blade density blower, this single fan is quiet and effective. Four T8 Torx screws hold the Wi-Fi antenna plate in place, an easy victory for iFixit's 54 Piece Bit Driver Kit. With a little wiggle this-a-way and a little wiggle that-a-way, we remove the antenna plate. WOW! Look at that-- the plate is identical to the one from last year. 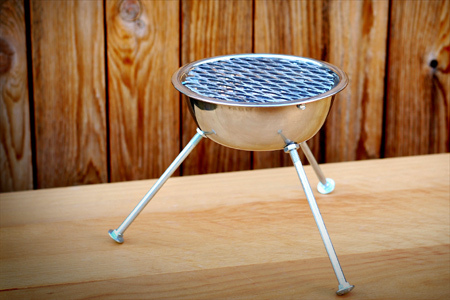 We like to imagine what else you could do with a grill like that. A couple screws and a connector and the hard drive is out, revealing a whole lot of, well, nothing. But wait-- was that an empty hard drive cable port next to it? The big question with this unibody mac Mini: "Can I install a second hard drive myself?" The centimeter and a half of extra space seem to imply so. There is definitely plenty of room for a second hard drive underneath the first. The only deterrent is the availability of a second, longer SATA hard drive-to-logic board cable. Update: We include that cable in our Mac mini Mid 2011 Dual Hard Drive Kit. Let's get the logic board out so we can get a better look. The release of the new Mac mini means the return of our favorite tool: the Mac mini Logic Board Removal Tool! Luckily, we have come prepared this time. No longer forced to use two screwdrivers, we insert our Mac mini Logic Board Removal tool, and it does the trick. The logic board assembly slides right out of the aluminum unibody. With the logic board removed, we see how a second hard drive could be installed. Two T6 Torx screws hold the speaker in its place on the logic board. With the speaker removed, this Mac mini can no longer bump fat bass beep at you. Our trusty spudger makes quick work of the Wi-Fi board's cables. More T6 screws hinder our path, but we will not be deterred. 802.11n connectivity is possible thanks to a Broadcom BCM4331 "single-chip wireless solution." The Broadcom BCM20702 Single-Chip Bluetooth 4.0 Processor with Bluetooth Low Energy (BLE) support is identical to the chip found in the 13" MacBook Air we just took apart. Just like in the previous Mac mini, the heat sink is held in place by a bunch of spring-loaded T8 screws. Some of the screws were a little different, though. We found T6 screws that were screwed into the top of T8 screws. A screw within a screw . . .
After de-routing a couple cables and unscrewing a few #00 Phillips screws, we were able to remove two antennas and the I/O wall from the logic board. The antennas are attached to the plastic I/O wall since wireless signals don't transmit well through metal. Ah ha, we meet again L-block. One T6 screw holds the power supply in place. After removing a small metal bracket and twisting the AC power-in port, the power supply slides right out through the mini's empty front. Look familiar to you, too? Good, then it's not just us. One more T6 screw and we can pull the IR sensor/receiver from the optical drive-- what? No optical drive? To make room for the additional hard drive option, Apple has removed the optical drive from this year's mini and replaced it with some good old-fashioned emptiness. The IR sensor stares straight into the depths of our souls. Sorry buddy, you won't find your lost optical drive here. Mac mini Mid 2011 Repairability: 8 out of 10 (10 is easiest to repair). No proprietary screws are found within the device. You can easily upgrade your RAM and hard drive, as well as add a secondary drive. There's no glue anywhere inside that needs to be removed while disassembling the mini. The CPU is soldered to the logic board and not user-upgradeable. While not difficult to do, you still have to remove almost all the internals in order to replace the power supply. What is the empty socket located about an inch above the CPU and GPU on the motherboard (same side as the SATA sockets)? Maybe it has something to do with the Radeon 6630m model? I ordered the Core i7/6630m model, I'll check when I get it and report anything different I see. What sort of cable is recommended for adding a second drive? I would like to buy a bare bones man mini, install a second ssd drive, and then install Lion on the ssd drive and use that as the boot drive. As we say in Step 7, you'll need an Apple proprietary SATA cable. Maybe someone will get their hands on a server version of the new Mac Mini and reverse engineer both of the cables so that they can start manufacturing ones that will fit perfectly.